The famous screenplay writer Kim Su Hyun (김수현) had recently raised a question on the plot of Deep Rooted Tree, attracting the concern from various parties. Chae Yoon is the name of the character in Deep Rooted Tree that is played by Jang Hyuk. Chae Yoon is a palace security officer that originated from slave class. As he strongly believes that his father died because of Le Do (King Sejong), he has secretly planned his revenge plan in his mind. At the initial part of the drama, there was even a scene that showed Ttol Bok (young Chae Yoon) couldn’t read his father’s posthumous papers as he doesn’t know Hanja. But, in episode 6 that aired on October 20th, 2011, Chae Yoon was writing Hanja on a piece of paper as a mean of communicating with muted court lady So Yi (played by Sin Se-kyung). During the scene, Chae Yoon looks he is an expert in mastering Hanja. But the drama never explains when he learned Hanja. Screenwriter Kim also wrote on her Twitter, “In the first episode, Chae Yoon can fly form the ground to the roof instantly, and then yesterday (episode 5) there was incredible martial art, shown, and today even the Hanja is no problem, since when did he learn Hanja? Haha,” a very sharp words. 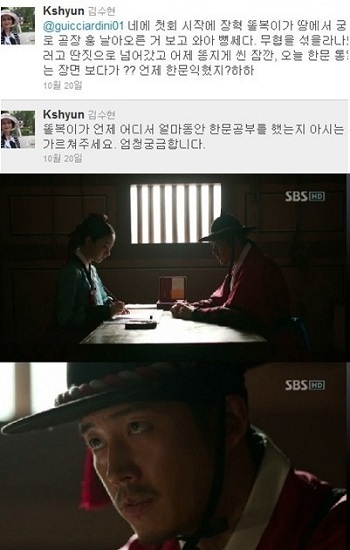 Netizens who saw the messages said, “Wow, really is Kim Su Hyun writer, what you said is rational and logical,” “You’re so busy but still spending time to watch Deep Rooted Tree,” but there are also objections raised by netizens, who felt that screenwriter Kim was too critical of the content, and had tendency to jealous of Deep Rooted Tree that has soaring ratings.